Just as the growth of a tree or a clam is recorded in rings of increasing size added to the growth of the past, so the development of an institution has its markers. The year 1960 has left its mark already in the addition of three Historic Houses .... Known as the Provincial Museum from 1868 and the Nova Scotia Museum of Science since 1947, will henceforth be known simply as The Nova Scotia Museum and will operate various branches which will retain names of their own. Welcome to the first edition of the Nova Scotia Museum’s newsletter Currents. Here we are, 58 years later, with 28 Nova Scotia Museum sites and as our 150th anniversary year draws to a close, it is an opportunity to reflect and take stock. We are still riding the high of our numerous celebrations capped off with the Museum East conference which was a great success. I want to extend special thanks and congratulations to the planning committee and the presenters. We received excellent feedback about this three-day event and will keep you informed as to our plans for the future. Another anniversary highlight has been the work of the People & Placescommittee who crisscrossed the province helping sites, sharing information and generating awareness of the great work happening in the NSM. So, please take a look and let us know your thoughts. To clarify, this is not an event posting forum rather the focus is on celebrating the work that we do. It is our intention to publish 4 editions a year depending on available content. We are always on the lookout for stories, which you can send along to novascotiamuseum@novascotia.ca. I encourage you to share Currents with your networks. "Looking behind myself and seeing where we were going"
In October, Roger Lewis (Curator of Ethnology, NSM) and Kayla Rutterham (Naturalist, Museum of Natural History), led a workshop at the Social Studies Teachers Association conference. They helped teachers engage with archival documents, presented the history of treaties in Nova Scotia, and discussed how to engage students from all backgrounds in Treaty education. APTN (Aboriginal Peoples Television Network) news featured the archaeological excavation at Fort Saint-Louis in Port La Tour, Shelburne County led by Dr. Katie Cottreau-Robins (Curator of Archaeology, NSM). Building off last summer's work, the team explored remains of the 17th century fur trade post which depicts early encounters and early trade relations between French settlers and the Mi'kmaq in the region known by the Mi'kmaq as Kespukwitk. We have just finished 150 days of celebrating our 150th anniversary. The celebrations included a special identity (as seen on new staff pins), a calendar of site events, social media (#NSM150), new retail bags, an exhibit & interactive project at all 28 museum sites, staff engagement visits, and the Museum East conference. These events were led by a cross-NSM steering committee: Melanie Bedgood (MNH), David Carter (NSM), Victoria Castle (NSM), Amy Coleman (MMA), Michelle Davey (McCulloch House), Jeff Gray (MNH), Matthew Hughson (FLM), Maggie MacIntyre (NSM), Janet Maltby (Rural Sites), and Christine Sykora (NSM). Probably the best way to describe Kaleb is in his own words: "I have always taken an interest in the tools and machines from before the time of motors and electricity". Although just starting this season, Kaleb, with a bit of help from past staff and Jeff Chamberlain (Kings Landing's miller), has mastered the milling of both buckwheat and whole-wheat flour and next summer will bring back Balmoral Grist Mill's signature product, Scottish oatmeal. Summer 2018 has seen some unique partnerships with NSM sites. Le Village historique Acadien hosted FIN Outdoor(Formerly the Atlantic International Film Festival Outdoor Film Experience) for the first event outside of Halifax, with a showing of The Muppet Movie. Prescott House Museum's annual strawberry social had a new group of volunteers, the Gold Wing Road Riders Association. Wile Carding Mill would like to recognize volunteer Karen Wentzell. This summer Karen led two popular workshops at the site: one in traditional wet felting and another in natural dyes and silk scarf felting. Plans are underway to offer similar workshops next season. Museum staff always have great stories. If you have a chance, grab a coffee with these folks to find out more about what they have been doing. Lisa Zygowski (Boat Builder, Fisheries Museum of the Atlantic) to hear about the new dory she built for the 80th anniversary of the museum's schooner Theresa E. Connor. Mike Huggins (Site Supervisor, Haliburton House) to hear about how the museum's grounds have successfully been turned into a popular disc golf course. Amber Laurie (Assistant Curator of Marine History, NSM) to hear about her recent trip to the V&A Dundee in Scotland, where she oversaw the installation of a wooden panel fragment from the Titanic, normally on display at the Maritime Museum of the Atlantic but currently in the Ocean Liners: Speed and Style exhibit. Ross Farm Museum for winning the 2018 Best Farm/Forestry Business in the Best of Chester Business Awards Campaign. Ross Thomson House for being nominated for the Town of Shelburne’s Outstanding Gardens. It is with sadness we mark the loss of former NSM staff, David Coldwell, who had a 38-year career as a model maker with the Nova Scotia Museum. The Nova Scotia Museum image collection is used by researchers, publishers, businesses, and other museums (to name of few). This original watercolour by H.N. Binney, a Halifax customs officer, provides one of the earliest authentic “snapshots” of daily life in a Mi’kmaw community. It is one of the most commonly requested images from the Nova Scotia Museum collection. The scene, a late 18th-century Mi’kmaw encampment, likely at present-day Tufts Cove in Dartmouth, Nova Scotia, clearly shows the central role that fishing played in Mi’kmaw life. Prior to the 1970s, arsenic was used as in taxidermy to prevent pests and biodeterioration. Arsenic is a carcinogen, and prolonged exposure can have impacts on human health. This summer, Frederica Jacks was hired as a Young Canada Works student to begin testing our taxidermy specimens, starting with the ornithological collections. Under the guidance of Andrew Hebda (Curator of Zoology, NSM) and Ian Loughead (Senior Conservator, NSM) Frederica developed and implemented a testing protocol, which determined that 70% of the specimens contain arsenic. This information will inform future decisions about use and safe handling of natural history specimens. 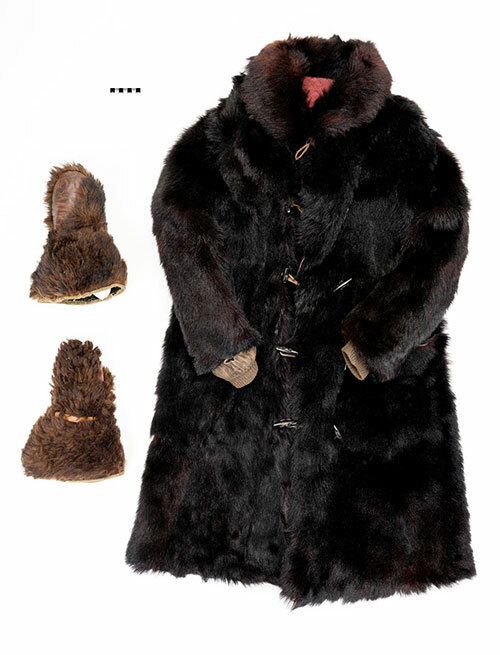 2018.1.1 & .2 - Men’s bear fur coat and gauntlet gloves (believed to be buffalo fur), worn by WWI veteran, Charles Russell Cameron, Sherbrooke, NS. These pieces add to an underrepresented part of the museum’s costume collection – men’s working (non-military) and winter clothing. Cameron ran the local customs office and delivered the mail. These items were worn at the local livery stables before the war and upon his return throughout the 1920s, in a period when coach and sleigh travel were standard modes of transportation in the winter. Cameron would go on to open the first gasoline service station in Sherbrooke. The museum is always finding new ways to share its information beyond exhibits and programs, such as these new resources. Graham Caswell's (Coordinator of Education Outreach, Museum of Natural History) Science on Sphere dataset "Human Migration from 2010-2015" has been used internationally after being featured by NOAA (National Oceanic and Atmospheric Administration). The Nova Scotia Museum Blog has several new blogs from the Curators. Check out #KatieCottreau-Robins #MartinHubley and #TimFedak. Every edition of NSM Currents will highlight a new or remind us of one existing NSM policy, procedure, or strategy. Sherbrooke Village launched its 2018-25 strategic plan and 50th anniversary legacy project to develop the Rural Institute for Cultural Heritage and Environmental Sustainability (RICHES). To subscribe from this list, send a blank email to NovaScotiaMuseum@novascotia.ca with the subject line subscribe.